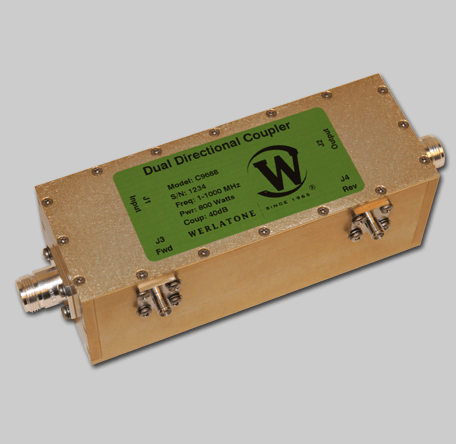 Werlatone offers the Model C9688, a 40 dB Dual Directional Coupler, covering the full 1-1000 MHz band. Rated at 800 W CW, the C9688 will operate into 3:1 Load VSWR, and is ideal for applications spanning multiple frequencies. This High Power design, measures 6 x 2.2 x 2.2" and is designed for military and commercial applications. Werlatone offers the Model C9688, a 40 dB Dual Directional Coupler, covering the full 1-1000 MHz band. Rated at 800 W CW, the C9688 will operate into 3:1 Load VSWR, and is ideal for applications spanning multiple frequencies. This High Power design, measures 6 x 2.2 x 2.2″ and is designed for military and commercial applications.